"From the Day Mike Fiorillo came to our home to do the inspection to the completion of the project we were completely satisfied..."
From the Day Mike Fiorillo came to our home to do the inspection to the completion of the project we were completely satisfied with all aspects of the job, Mike was always there to answer any questions and I had many, and Wilver and crew were outstanding! 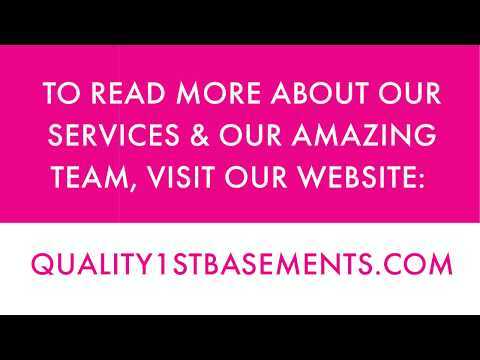 Michael and the team at quality basement was extremely professional and thorough in the details they provided to help me understand the issue and how it was being resolved. There were no point during the process that I felt pressured To make a decision to start the work or sign any contracts. I was given the time and space to make my own decision after being provided with all the information needed. The crew that did the work was extremely professional and kept everything very clean without making a huge mess even though it was a big project. Would definitely recommend since their work does come with a lifetime guarantee as well! A+ for Quality 1st basement! Michael has years of experience in sales, working as a Sales Manager. This experience has given him a good understanding of customer service. He enjoys helping homeowners keep their homes healthy and safe. Michael also knows the importance of providing thorough inspection to make sure all the homeowner’s concerns are addressed during a waterproofing inspection. At the inspection, Michael explains to customers how he can accomplish their basement goals. He guides each homeowner through the entire process from start to finish. His attention to detail, customer service, and extensive product knowledge make him a tremendous asset to the team and to each homeowner he meets. In his spare time, Michael enjoys working out and staying fit, spending time with his puppy, watching movies and building computers. A homeowner in Toms River, New Jersey had water in their crawl space and contacted Quality 1st for a solution. Our System Design Specialist inspected the crawl space and recommended that the crawl space be encapsulated. A full encapsulation system was installed to ensure that the crawl space stays dry and healthy. CleanSpace vapor barrier system was installed on the crawl space walls and floors to make sure no water vapor or humidity passes through to ensure that the crawl space stays dry and the homeowners can use it for storage. Check out this great before and after of concrete raising! PolyLevel was injected beneath the sinking porch, raising it back towards its original position. Not only does it stabilize the concrete but it also prevents future settlement! Our Q1 Team did a full encapsulation in this damp crawl space! Jonathan and his crew installed SilverGlo on the walls. SilverGlo is a heat barrier that helps keep the heat contained. Next our Vapor Barrier Liner, CleanSpace, is installed over the Silverglo, on the walls and floor. CleanSpace will protect the crawl space against water seepage and mold, keeping the area clean and healthy. A homeowner in Little Silver, New Jersey had a damp crawl space, which was causing moisture and high humidity. Our System Design Specialist inspected the crawl space and suggested it be encapsulated to eliminate the dampness and humidity. First, Drainage Matting was installed on the crawl space floors to make sure the water does not get trapped underneath. The matting has raised dimples so the water has a channel to be directed to the sump pump. CleanSpace was installed on the crawl space walls and floors to hold back humidity and water vapor. CleanSpace is a durable bright white liner that will not rip or tear making it perfect if the homeowners want to use it for storage. Also, the SmartSump sump pump that is specifically designed for crawl spaces was installed. This sump pump is capable of pumping 2,500 gallons of water per hour. This sump pump is designed specifically for crawl spaces and to fit in with the CleanSpace system. Our team went in and completely transformed this damp and smell crawl space into a dry and healthy area underneath this Belford, NJ customer's home. We installed our moisture vapor barrier system known as CleanSpace along the walls and floor. Our System Design Specialist, Mike D also recommended our SmartSump pump system to prevent water from seeping through the foundation walls. Lastly we installed a Sedona Dehumidifier to prevent musty odors from forming. A homeowner in Upper Saddle River, New Jersey had a crawl space that they were not using because it was damp and moist. The homeowners contacted Quality 1st for a solution. Our System Design Specialist inspected the crawl space and recommended an encapsulation system be installed. CleanSpace, a vapor barrier system was installed on the crawl space walls and floors so water vapor and humidity does not pass through. A homeowner in Old Tappan, New Jersey was having water in their crawl space and contacted Quality 1st for a solution. Our System Design Specialist inspected the crawl space and suggested that a full encapsulation system be installed to make sure it stays dry and healthy. CleanSpace Vapor Barrier System was installed on the crawl space walls and floors to hold back water vapor and humidity. CleanSpace is a durable bright white liner that will not rip or tear making it perfect for storage. The homeowners can now use their crawl space for whatever they need to.